(Nanowerk News) Graphene, considered the most exciting new material under study in the world of nanotechnology, just got even more interesting, according to a new study by a group of researchers at the University of Colorado Boulder. The new findings -- that graphene has surprisingly powerful adhesion qualities -- are expected to help guide the development of graphene manufacturing and of graphene-based mechanical devices such as resonators and gas separation membranes, according to the CU-Boulder team. The experiments showed that the extreme flexibility of graphene allows it to conform to the topography of even the smoothest substrates. 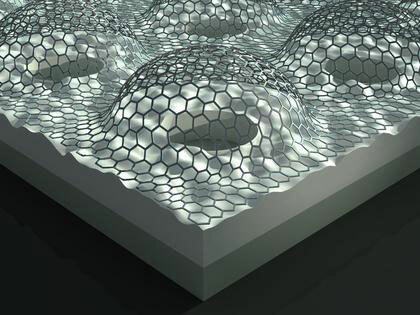 Graphene consists of a single layer of carbon atoms chemically bonded in a hexagonal chicken wire lattice. Its unique atomic structure could some day replace silicon as the basis of electronic devices and integrated circuits because of its remarkable electrical, mechanical and thermal properties, said Assistant Professor Scott Bunch of the CU-Boulder mechanical engineering department and lead study author. A paper on the subject was published online in the Aug. 14 issue of Nature Nanotechnology ("Ultrastrong adhesion of graphene membranes"). Co-authors on the study included CU-Boulder graduate students Steven Koenig and Narasimha Boddeti and Professor Martin Dunn of the mechanical engineering department. "The real excitement for me is the possibility of creating new applications that exploit the remarkable flexibility and adhesive characteristics of graphene and devising unique experiments that can teach us more about the nanoscale properties of this amazing material," Bunch said. Not only does graphene have the highest electrical and thermal conductivity among all materials known, but this "wonder material" has been shown to be the thinnest, stiffest and strongest material in the world, as well as being impermeable to all standard gases. It's newly discovered adhesion properties can now be added to the list of the material's seemingly contradictory qualities, said Bunch. The CU-Boulder team measured the adhesion energy of graphene sheets, ranging from one to five atomic layers, with a glass substrate, using a pressurized "blister test" to quantify the adhesion between graphene and glass plates. Adhesion energy describes how "sticky" two things are when placed together. Scotch tape is one example of a material with high adhesion; the gecko lizard, which seemingly defies gravity by scaling up vertical walls using adhesion between its feet and the wall, is another. Adhesion also canplay a detrimental role, as in suspended micromechanical structures where adhesion can cause device failure or prolong the development of a technology, said Bunch. The CU research, the first direct experimental measurements of the adhesion of graphene nanostructures, showed that so-called "van der Waals forces" -- the sum of the attractive or repulsive forces between molecules -- clamp the graphene samples to the substrates and also hold together the individual graphene sheets in multilayer samples. The researchers found the adhesion energies between graphene and the glass substrate were several orders of magnitude larger than adhesion energies in typical micromechanical structures, an interaction they described as more liquid-like than solid-like, said Bunch. The CU-Boulder study was funded primarily by the National Science Foundation and the Defense Advanced Research Projects Agency. The importance of graphene in the scientific world was illustrated by the 2010 Nobel Prize in physics that honored two scientists at Manchester University in England, Andre K. Geim and Konstantin Novoselov, for producing, isolating, identifying and characterizing graphene. There is interest in exploiting graphene's incredible mechanical properties to create ultrathin membranes for energy-efficient separations such as those needed for natural gas processing or water purification, while graphene's superior electrical properties promise to revolutionize the microelectronics industry, said Bunch. In all of these applications, including any large-scale graphene manufacturing, the interaction that graphene has with a surface is of critical importance and a scientific understanding will help push the technology forward, he said.